Taking care of your melanin is an ongoing learning process. You as a dark skinned beauty, have some of the most sensitive skin on the planet. Pull a chin hair and you�ve got a dark spot. Exfoliate to hard and you�ve got skin discoloration. Medications can even change the complexion of your skin. So here are a few tips to help you get off to a good start in caring for your beautiful black skin. 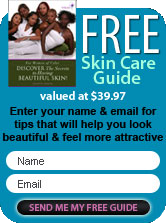 Have a Good Skin Care Regimen - A good skin care regimen will help your beautiful black skin stay black and beautiful. A basic three step regimen will help your skin maintain it�s radiance. Cleanse, tone and moisturize on a daily basis. Once a week, you will add two more steps - exfoliation and a masque. When it�s in your budget, get a professional facial done by someone who understands working with melaninated skin. Yes, there is a difference. Don�t wipe, Blot! - When perspiring from a good workout, the summer heat or a personal summer (hot flash), wiping your skin can stretch and pull it causing it to eventually sag. Instead, blot with a soft towel, paper towel or handkerchief. If it�s moistened, that�s even better. Your skin will feel cool and refreshed. Put the tweezers down - Pulling those chin hairs can cause some serious damage. Not only are you setting up damage to your skin by pricking and tugging on it, breaking the hair can cause it to turn into your skin. Now you�ve got an ingrown hair. What do you do? You go deeper and cause more damage, not to mention dark spots and uneven skin tone. Leave the hair removal to the professionals. Get a chin wax or have it sugared or threading done to remove unwanted facial hair. Summer Heat and Skin Care Products - The intense heat from high summer temperatures can wreak havoc on your skin care products, especially when your air conditioner stops working. Keep your beauty products in a cool dry place or make room in your refrigerator not your freezer, especially for your cream cleansers and moisturizers. Heat, especially extreme heat, can change the composition of a product and cause it to loose its consistency. The coolness can also be refreshing to your skin. Cold Weather and Skin Care Products - The cold weather temperatures can bring just as much havoc to your skin care products as the summer heat. Cold temps can make honey based products crystallize. The same cold temp can make your coconut oil based products solidify. This brings both products to a solid stand still. A little steam as you take your shower should help in softening these products. To my impatient ones that have a tendency to run hot water over the container, don�t leave it running while you take your shower. This will change the consistency of your product and if this is done overtime, it can often change the results you seek from the product. Keep Your Hands Off Your Face - During the course of any given day, your hands touch everything imaginable. Do you share a computer at work? What are the habits of that person? What are your habits? Do you wash your hands when you return to your desk from lunch? Count the door handles and knobs you've touch on your lunch break. Frightening? Yes your hands and fingers touch every surface imaginable and you have no clue of what's waiting to attach themselves to you. Touch your face and you could be inviting the next breakout to your skin. Sunscreen - Yes you need sun protection. The key is to find a product with natural/organic ingredients that will protect your skin. This will truly take testing on your part. Natural minerals are being added to sunscreens to block sun rays and protect your skin. Zinc oxide is one of them. It forms a physical barrier on your skin, reflecting the sun�s rays instead of absorbing them. The challenge with melanated skin, is that often times these blends will make you appear pasty white. An SPF 15-30 is all you need. Some of you have shared that you use Shea butter. If your Shea butter has been processed and has added fillers to stretch it, you just might burn from the sun instead of blocking it. Coconut oil is another product that has been used. Know your skin type because using coconut oil has also brought damage to some of you as well. For those of you that swear by the oils - coconut, jojoba, olive - as sun protectors, a few drops of lavender essential oil in your mix can possibly ward off damage to your skin. Lavender essential oil has been known to help with sunburn or damaged skin. Exfoliate! - At least once a week, exfoliate your skin from head to toe. Exfoliation helps remove dead skin cells that build up on your skin. This build up can actually cause your skin to have a dull, gray, ashy look. Ingredients are key with a good exfoliation product. Do not use harsh abrasives such as walnut, almond or peach shells. If they�ve been reduced to a powder form, it�s okay. I suggest a product with jojoba wax beads. They are tiny pebbles that come from the jojoba wax plant and melt as they are manipulated on your skin. Do not use the same exfoliation product on your face that you use on the rest of your body. You�re working with two different skin types and the formulations for face products and body products are different. At least they should be. Masque - A good facial masque treatment once a week is good for your skin. 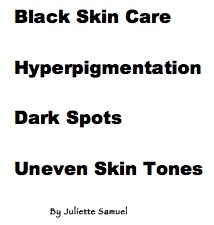 Knowing your skin type is important here. Oily skin types tend to benefit from clay masque. They help minimize the oil production in your skin. Honey masque on the other hand, tend to hydrate, soften and smooth normal, dry and maturing skin. Bleaching Creams - This is a touchy subject, especially for my dark skin beauties. Bleaching your skin can have serious ramifications. Some of the ingredients used - formaldehyde, hydroquinone - are banned in other countries and have been known to increase the risk of cancer in some and cause cancer in others. Learn to love the beauty of your bronzed and beautiful skin. It protects you from more than you know. Ingredients - Of course natural/organic will be the best choice. However, even they will sometimes irritate your skin. Get to know your skin and it will tell you what works best for it. Cleansers - Products, especially cleansers for normal, dry and maturing skin, that are cream based will provide a more gentle yet effective way of caring for you skin. While oily skin can benefit from cream based cleansers, they can also see great results from aloe vera based cleansers that have baking soda and essential oils as some of their ingredients. Alcohol can be drying to your skin, so if you choose to use it, do so sparingly. Serums - Oil based serums can be comforting to skin irritations, while aloe vera based serums can offer comfort to acne prone skin. Moisturizers typically creamed based, are often used to prevent dryness in your skin. Daytime moisturizers are usually lighter in consistency, where as night creams or eye creams are a bit heavier. Some moisturizers can be emollients and humectants. Emollients provide a softening and soothing feel to your skin, while, humectants help your skin to retain or preserve its moisture. Hyaluronic acid is the go to humectant being used in skin care products today. Some natural/organic ingredients often used in moisturizers are aloe vera leaf juice, Shea butter, calendula flower, jojoba oil, avocado oil, Lavender essential oil and grape seed oil � just to name a few. This is by no means the end of my tips. Stay tuned as we update this tips list to include hair as well.